Maria Loroño-Leturiondo and Ibon Galarraga. 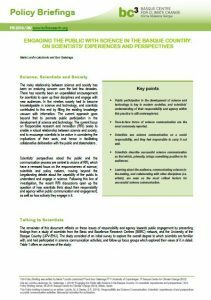 -Public participation in the development of science and technology is key in modern societies, and scientists’ understanding of their responsibility and agency within this practice is still underexplored. – Face-to-face forms of science communication are the most commonly reported. 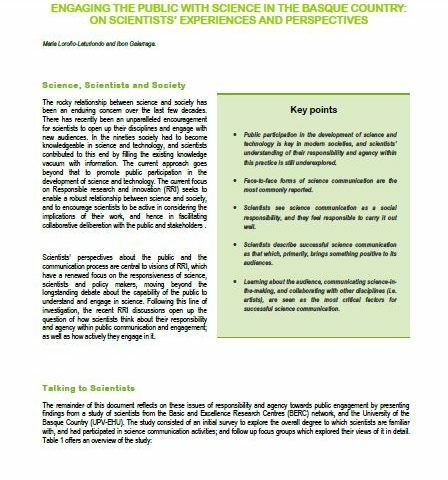 – Scientists see science communication as a social responsibility, and they feel responsible to carry it out well. – Scientists describe successful science communication as that which, primarily, brings something positive to its audiences. – Learning about the audience, communicating science-in-the-making, and collaborating with other disciplines (i.e. artists), are seen as the most critical factors for successful science communication. The BC3 Policy Briefing Series is edited by Mikel González-Eguino and Sebastien Foudí. The opinions expressed in this policy briefing are responsibility of the authors and do not necessarily reflect the position of Basque.Centre for Climate Change (BC3).